Best of luck to Nikki Sinclaire, Trevor Colman, Gary Cartwright and the Futurus team. A real way forward for the euro-realist movement! It was nice to meet up with some old friends as well as some current colleagues at a recent meeting in London to discuss the relaunch of FUTURUS, the think tank. One of the many criticisms that has come out of the recent civil war in UKIP is the lack of academic integrity and a reliance on outdated arguments. FUTURUS will not be a UKIP project as such, that would not help our case at all, it will be non-party political, but with strong eurosceptic leanings. There are certain policy areas in which eurosceptics are provided with rows of open goals. Sadly these are all too often missed, amongst the shadow chasing and in-fighting that dominates our slice of political space. FUTURUS is not the only such project emerging at present, and I think we can look forward to a long-awaited refreshment and rejuvination of our platform. I was delighted to receive a copy of the new book ”Too ‘nice’ to be Tories? : How the modernisers have damaged the Conservative party” by Anthony Scholefield and Gerald Frost. The author's analysis of the flawed reasoning behind the modernisation of the Conservative party is extremely interesting and their arguments convincing. I strongly recommend it. Nikki Sinclaire Battling for Britain. Her campaign for a referendum on membership of the EU continues to gain support! 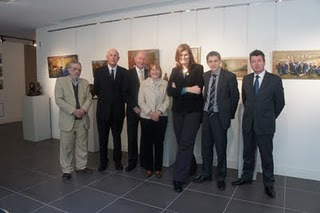 I have always emphasised the cross-party nature of my Campaign for a Referendum on our continued membership of the EU. 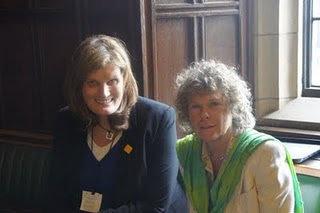 And so I was delighted recently to have the opportunity to meet two of the most respected eurosceptics in the House of Commons, Kate Hoey and Austin Mitchell, both Labour MPs. After a nice lunch with Kate, I joined Austin for tea, and we had a very productive talk. I look forward to working with both of them in the near future. 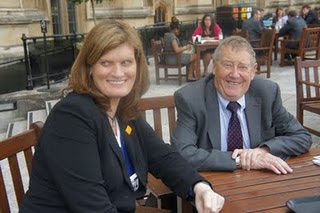 I was also pleased to be introduced by Kate to Phillip Hollobone, Conservative MP for Kettering. He is a supporter of the Better Off Out Campaign, and I was very pleased when he added his name to the list of signatories on my own petition for a referendum. How rather unfortunate for Farage that Lega Nord now holds the balance of power in the EFD group. Poor Nigel. The demands are already being made! David Campbell-Bannerman, UK Independence Party MEP has quit the party and rejoined the Conservatives, saying, " I have been pleased with the robust stance taken by David Cameron and Conservative MEPs over the EU budget negotiations and I believe that it is Conservative MEPs who are working hard to defend Britain's interests." Campbell-Bannerman has been unhappy for a long time and that he has been negotiating a new seat for himself in the next European elections, and it is this that has complicated the defection. It is suggested that the Conservative MEP, Giles Chichester is going to let him have his place as Chichester intends to stand down at the end of the current parliament. In 2010, Campbell-Bannerman wrote a trenchant criticism of David Cameron and the Conservatives in the UK Guardian newspaper, accusing them of hypocrisy, "Over the years observers in Brussels have learned first hand how the Conservatives talk Eurosceptic at home but behave quite differently when they arrive in the Belgian capital to carry out their parliamentary work." He added, "It's overwhelmingly clear now that trusting Cameron with Europe will be as misguided as trusting Blair on Iraq." There is one tiny little matter... Lega Nord are now the largest party in the EFD Group. Will they now exert their influence on the Group, and how would UKIP’s image in the UK be affected by the antics of Mario Borghezio, who spent defection day promoting a book on how white people are the victims of racial harassment? And congratulations from the Junius Team to Greg Lance-Watkins on his marriage to Lee Rowlands, his long-term girlfriend. The happy event took place today in Chepstow. Have a great honeymoon! Claims during interview that UKIP is not a political party, just a pressure group. 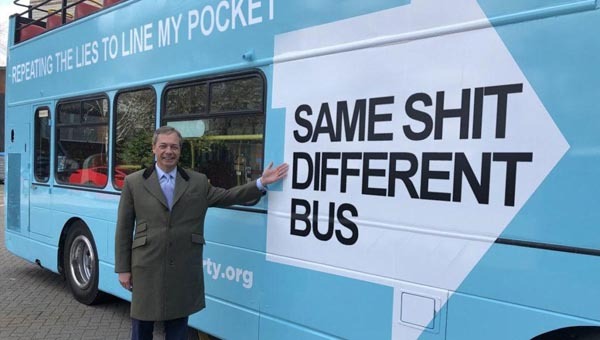 Blames Farage for driving out members and also for failing to listen to the membership. Says he has changed his mind about the Tories and now believes that they are euro-sceptic. Someone should really tell Cameron that he is now a euro-sceptic. He will be surprised! Correct us if we're wrong but we heard that Cameron was committed to a policy of keeping Britain IN the EU. Does David know something that the rest of the country doesn't? And our view? 5 out of 10 for the cheek. And 1 out of 10 for the most unconvincing attempt to justify his decision to rejoin the Tories. Andrew (Steve) Reed, assistant to Nigel Farage, has done it again. He has repeatedly made his office look foolish through his infantile linguistic pretensions, and his bizarre efforts at appearing cosmopolitan. Taken from Nigel's photo album. Annabelle is never far from his thoughts. The failure of the 'Rally Against Debt' on May 14th to attract any real support has been the source of much merriment in the press. Basically, a bunch of Tory twits were calling for less money to be spent on the public sector. Of course, the public sector is quite heavily funded, and there are good reasons for concern. However, how hypocritical is it that one of the organisers of the event is Annabelle Fuller, paid from the public purse herself, via the MEP assistants allowance of Nigel Farage? Ms. Fuller, whose lucrative EU contract allegedly depends upon her 'personal relationship' with Farage, personifies the waste in the public sector. Farage, of course, was a speaker at the event. Doesn't it all leave a nasty taste in one's mouth? Nigel, take my hand. You had a good run but all political careers ultimately end in failure and the wolves are gathering at the door. Hand the poisoned chalice to Paul and let me take you to a better place. And so the very public UKIP train crash continues. It beggars belief that Farage could be so stupid as to publicly attack Andreasen and then act surprised when she decides to respond likewise! And as for that idiot Steve Crowther! He should be renamed The Puppet. No wonder the Tories are laughing in Brussels. 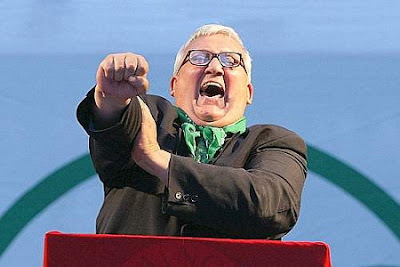 And Bannerman is laughing the loudest! Marta responds to Nigel's last letter (LINK). She pulls no punches! During the Politics Show last Sunday you stated that I had “not even been to the UK for several months”. You have failed to retract this untrue statement and instead raised further unfounded accusations. The fact is that I have been and “been seen”- there is public record- in the UK regularly, raising UKIP´s credibility at important events as the voice of opposition. A search on the Electoral Commission website returns only one donation made by you to the party in the last 10 years. The donation of 1,100 pounds sterling to the South East region was made in March 2009, that is before the last European election. The code of conduct demanded that MEPs “set up an office in their region, funded from their Parliamentary general allowances”. However your declaration of financial interests as it appears in the European Parliament website under your name , shows that in fact your office in the South East region is given to you free of rent by a member of the party. Now one wonders where and how you are actually using such allowance. Contrary to what you state I corrected bookie Mr. Alan Bown about my having an office in Woking when he surprised me back in January in the presence of Mr. Stuart Wheeler with the accusation -which I now realize must have originated from you- that I did not have an office. The fact is that I fund my office – located in an office building in Woking – out of my parliamentary general expense allowance, the address having been registered with the Council, communicated to Head Office and it also appears in my newsletter. From the above it is clear that it is you and not me the one who has failed to honor the famous code of conduct that we were asked to sign when we stood as candidates for election in 2009. Do you by any chance believe it does not apply to you? Unfortunately you have decided to put this on the public domain even before I had the chance to read it, so this is going on my website. Voters look for credibility which is what, in my view, your actions are not a representation of. Thank you for your letter of 23rd inst, in which, however, I quite fail to see how my saying of you, "she hasn't been seen in the UK for several months", qualifies as "personal invective", let alone slander! This statement of mine was made in connection with your activities in the UK, as a UKIP representative of the EU's South East of England Region, in two areas, as follows. 1. In relation to the recent, local and regional elections, in England, Scotland, Wales and Northern Ireland: in my view, your involvement in campaigning for the Party, over the last few months, has been scant - not to say non-existent. Were you, for example, in Oldham, Barnsley or Leicester, for the vital by-elections in those constituencies? If you have been holding public meetings or branch/constituency events in the South East, of course, then I may be overstating my case. Kindly let me know if you have. 2. In relation to promissory commitments made by you to UKIP, in the event of election to the EU's Parliament: along with all of UKIP's elected members, you signed a declaration consisting of a number of undertakings concerning the role of a UKIP MEP. One of these undertakings was to make legally acceptable donations to UKIP, as a registered voter in the UK, which you have now wilfully ceased to be. Another was to maintain an office in the constituency; and yet, when Mr Alan Bown enquired after the address of your South East Constituency Office, you were unable to provide him with one. Overall, I feel that my comment to the effect that you are not engaged with UKIP in the UK is a fair one. On the specific point of your political activity in the UK over the last few months, I would be happy to stand corrected and will happily say so. Steve ' Labour conspiracy theory' Crowther, in a crass act of stupidity, posted this private letter on the UKIP members only forum. When will they EVER learn? Did they really think that this would help matters? It will just push Marta into seeking redress through the courts. So is this what Farage meant when he pledged to make UKIP more professional? Now what did Bannerman say? Nigel's taste for pursuing personal vendettas on the party’s credit account, has led to a legal bill running at £140,000 a year. Yet again Farage makes matters worse due to his inept leadership and total inability to accept any criticism. A wiser man would have attempted to pour oil on the waters by having a private meeting with Andreasen to discuss their differences. But not our Nigel! And don't forget that it was Farage - despite numerous warnings - who ignored ALL the selection rules to ensure that she became his 'running mate' in the euro elections. Andreasen is a UKIP MEP thanks to Farage. There is little point in him complaining now! I am writing about numerous breaches of the Rules for Candidates by three candidates in London. One of them is Ralph Atkinson, but I will not go into details as I know Gerard Batten has already informed you about his activities.The other two are Marta Andreassen and Tim Worstall who I believe should be disqualified from this election. I am aware that Marta has decided to run in SE Region but believe that she should be disqualified in London and her votes reallocated since she was not entitled to them. This is quite a long email, I'm afraid, but there are an awful lot of rules being broken. A British citizen.... or a citizen of another member state who is resident in the UK or Gibraltar during the nomination period. Both Marta and Tim are clearly not UK residents. When asked about this at the London hustings Marta airily replied she was 'addressing' this issue. Some people I spoke to afterwards interpreted this (possibly cynically, but in the light of recent developments perhaps not) as roughly meaning ' if I get a high place on the list I will find an accommodation address in the UK for the minimum time necessary to meet Elcom criteria'. Tim has apparently said he will move back to the UK 'soon'. Seems odd since he is reportedly a tax exile who can only spend 183 days in the UK and he is building a house in Portugal for himself and his family and they are currently all resident there. Christopher Gill's response to this was that he had not bothered to consult Elcom or check its rules as this was an internal election - unbelievable! One would hope that UKIP will not be a party to any breach of certainly the spirit, if not the letter, of the Electoral Commission rules but according to Christopher Gill: 'At a later stage all candidates will of course have to comply with whatever electoral legislation is then in force or otherwise be disqualified from standing' which seems to confirm the cynics' idea that an accommodation address will be found for them for the minimum amount of time necessary. Under its constitution UKIP restricts full membership to UK citizens and resident foreign nationals. It also requires its Parliamentary candidates to be fully paid-up members in good standing. Marta could therefore not possibly be a full member at the time her nomination was made and must therefore be ineligible. Christopher Gill says she is an Associate Member but cannot tell me exactly how many other Associate members we have in the Party and indeed how many of them there were before Marta was given this (possibly) unique status. Certainly nowhere on the membership application form is there an option to become an Associate Member. The UKIP constitution also states (16.4) 'All parliamentary candidates must be paid-up members of the Party in good standing...' - no mention of associate members there, I see. Marta and Tim had the same proposer - Lord Pearson. This is expressly forbidden but Christopher Gill has told me categorically he is not prepared to take any action as he felt 'Lord P. was only being helpful'! Apparently breaking rules is OK if it is Lord P. doing it for Marta and Tim! All candidates were mandated to have a full, advanced CRB check (not something vaguely similar in another country, but the full UK version). Indeed, £41 of the £250 deposit was for this purpose. So important are these checks considered to be when identifying suitable candidates that the London Assembly candidates list was delayed for two months last year because of the requirement by the leadership, at a late stage, for all candidates to have these checks. You will all recall Nigel Farage stressing the importance of these checks and saying that if we had them in place in 2004 they would have picked up Ashley Mote's transgressions - therefore it was imperative that all candidates must have them in 2008. But to have a CRB check you need a UK address at which you reside and for which you can produce utility bills. Once again neither Tim (who I believe can only spend a certain amount of days in the UK, which would indicate he is non-resident for tax purposes) nor Marta (who lives in Barcelona) would have been able to obtain a UK advanced CRB check as neither is resident in the UK. Why was an exception made for them? Very odd reply from CG to this one 'Marta has never made any attempt to hide the fact that she lives in Barcelona'!! and 'Tim lives in Bath'. However, TW told me that although he owns a flat in Bath this was rented out and he was living in Portugal with his family. It was clearly required that candidates make it clear, both at the hustings and by other means, if they are standing in more than one Region. Marta certainly didn't mention it at the London Hustings, nor is it in her published candidate details. Many of these members who might otherwise vote for a certain candidate would be far less inclined to do so if they knew he/she actually considered our Region second best. Christopher Gill's response was: 'The point you make about declaring an interest in another region is well made - in a message to all MEP Interview Panel Chairmen dated 10th July David Challice highlighted the fact that the onus was upon candidates to publicly disclose if they were standing in more than one region. This instruction seems to have been ignored in at least one other region to my certain knowledge and will feature in my report'. What use is 'featuring in his report' going to be? The damage has been done and another rule broken. I know that the fact the shortlists were published on the UKIP website should apparently have enabled members to do some detective work and identify who was standing in more than one Region - but again this does not seem to comply with the spirit of the rule or why it was made, as very few of our members ever look at the website, let alone delve deeply into the members section, and I doubt one in a thousand of our 'ordinary' members, as opposed to those of us more involved with the Party, is aware of multi-region candidates. All candidates were required to give their UK electoral roll number on the application form. Unless they have given a false address, neither of these candidates can possibly be on the UK electoral register. Christopher Gill acknowledges this is a problem for MA which should have been noticed and addressed earlier, although he contends that TW is a UK resident (wonder if HMRC know this?) but again refuses to take any action. From this litany you will realise why many of us are extremely sceptical about the validity of these two candidates. At every turn it would appear that exceptions and accommodations are being made, and rules broken and ignored, to get them on, and keep them on, the candidate lists. I would appreciate a full explanation of why they were exempted from the stringent criteria that the rest of us had to comply with in order to be considered and would ask the NEC to disqualify both of them. I believe I would have been very firmly rejected - and rightly so. Such chicanery will not play well with Elcom or our other enemies in the media and the community at large. And there are a number of people already aware of these facts, and upset about them. Indeed some of these questions have already been asked on the Democracy Forum - whose members number many who most certainly do not wish us well - so are thus in the public domain . This really could badly damage our chances in the 2009 elections and we should not be putting ourselves in this position. I would formally ask the NEC to disqualify these two candidates from standing in London Region. Please do not think I have anything personal against Marta - on the contrary, my limited acquaintance with her has always been a pleasure. And Tim seems a personable sort of fellow. But rules are being broken and distorted to keep these two candidates on the list and this is simply WRONG.I have already informed Christopher Gill that should this request be ignored then I wish to withdraw from the London list, and whilst I will do everything to ensure Gerard is elected I will not campaign or fund-raise if Atkinson, Andreassen or Worstall remain on the List. I have also told him that I want my £250 returned as this has obviously been taken from me under false pretences. The false pretext in this case being that all candidates would be treated equally and subject to the same rules, which is patently not the case. After being sued in the Court for the return of her £250 deposit UKIP paid her the money, plus costs. However, they refused to admit liability and said that they were returning her deposit “as a gesture of goodwill”. This is, of course, complete nonsense. UKIP returned the deposit because Lynnda asked for documents, including a copy of Marta Andreasen’s application form and a copy of her £250 cheque and CRB documentation. It is thought these may not have existed in a form which would have satisfied the Electoral Commission or UKIP’s Constitution. Tim Worstall’s application form would have proved interesting reading since he was a tax exile living in Portugal and, therefore, could not be a full member of UKIP, legally pay his £250 donation OR get a CRB check. Poor Derek! It was pointed out to us that Derek looked rather distracted at the last East Midlands regional meeting. Can we offer Derek some advice? Open up and let the members know what is SO bothering you. Or would you rather Junius and GLW tell them on your behalf? So Derek, why not tell the membership of UKIP about the conclusion of the OLAF investigation? They have a right to know. What a pity that you told UKIPPERS at TWO regional meetings that you were NOT under investigation by the EU's anti-fraud office. Bet you feel rather foolish now! The wolves are now really at the door! Marta is not best pleased with Nigel after he claimed during a TV interview (Sunday's Politics Show with Jon Sopel) that Andreasen was out of touch, didn't know what she was taking about and hadn't even been to the UK for several months. 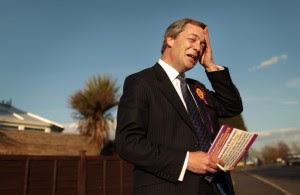 Nigel also admitted to Jon Sopel that UKIP had got their strategy wrong for the local elections. However, he tried his usual tactic of blaming everyone but himself. Marta is now threatening legal action UNLESS he withdraws the comments about her. This leaves Farage in a very, very awkward position. What can he do? 1. Apologizes and retracts his statement. This will be admitting to openly lying about her on national TV. Even the sycophants will be hard pressed to defend that! 2. Refuses to retract. Andreasen can then sue the UKIP leader for libel as his comments - she will claim - damage her reputation as a politician. And she has the money to do it! A very public train crash. Something that UKIP is very good at! I note with dismay your personal attack on me during your politics show interview with Jon Sopel last Sunday 22 May. You will be aware and should have noted that during the course of my media appearances and the blog /press releases that I have sent out to highlight my lack of confidence in your leadership post the recent local elections, not once did I resort to personal invective. I have been at pains to stick to a rational point which I restate here: winning only 0.7% of the seats contested is a dismal result. Or to put it another way as the interviewer put it to you and you conceded: Seven council seats won out of a possible nine thousand is indeed “small beer”. What I cannot and will not tolerate however is your assertion that “she hasn’t been to the UK for several months”. I have been to the UK on numerous occasions in the past months. While you choose to in your own unique style of campaigning, I am hard at work acting on behalf of my constituents as well as keeping them informed of my activities at local and European level through my monthly newsletter. In your interview you have slandered me in a very personal way that was not only uncalled for (however not entirely unsurprising given your abject failure to answer the substantive points that Mr Sopel put to you) but was also patently untrue. The potential audience for the politics show is in the Millions. As such I cannot and will not allow your comments to stand on the public record. I am writing to demand a full retraction from you of your comments about me not being in the UK. If this retraction is not immediately forthcoming you will leave me with no option other than to seek alternative avenues of redress. As you were speaking in your capacity of current Leader of UKIP, your comments also carry implications for the party if a retraction is not forthcoming. I look forward to your reply and retraction. On Wednesday, the former commission chief accountant said she "stood by" her demand. It is the latest bombshell to hit the party after the decision by David Campbell Bannerman earlier this week to defect to the Tories. Farage was overwhelmingly re-elected leader of UKIP only last November, but an unrepentant Andreasen said, "I have called for the resignation of the leader of UKIP and still stand by that position." She explained, "Many in the party have argued for years that to be able to get out of the EU we need to have a presence at national and local level in addition to the one we have at European level. "In 2009 when UKIP came second in the European elections we all celebrated and anticipated the start of a new era where the party would grow to become a credible option not just at European level but also at national and local level. "I put a lot of effort into that election, not only by travelling around the country speaking in support of candidates, but also by managing the party coffers, a key role in a growing party, not least during election. "Complying with the electoral commission requirements and making ends meet in UKIP proved to be a terribly difficult job as there was no financial discipline." She added, "However, today the party is bankrupt and so it has been for the last six months at least." She said one of the reasons for her demand was that the party "has engaged in costly and unnecessary court cases resulting from Farage's internal disagreements with colleagues or staff members. "The party has also engaged in the costly and unnecessary promotion of by-elections where we had no chance at all of winning a seat and UKIP has recruited staff over and above its capacity. "The management of the resources that we get from the EU as a result of our belonging to a political group is subject to the same abysmal mismanagement characterised by undemocratic and non-transparent recruitment decisions." She said, "My disappointment started when Nigel announced he was standing down as leader eight months before the general election and with no advance notice. Buckingham's results left me in doubt about his strategic ability, which up to that point I was convinced he had. "The results of this year, whatever the EU-style massaging of the figures, are bad without doubt: winning only 0.7 per cent of the seats contested is a dismal result. "And Nigel, who promised great success, should be the first one to recognise this." Farage was not immediately available for comment but senior UKIP member Godfrey Bloom leapt to the defence of his colourful colleague, telling this website he was "astonished" at calls for him to go. 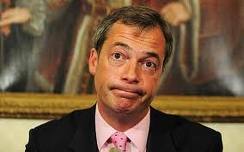 He said, "Nigel was re-elected by a large majority of members. The election results were our best ever and I, and others, are stunned by what Marta is saying. "I fully support Nigel as leader and cannot understand why she is doing this." We note that Godfrey Bloom - serial idiot, drunkard, womaniser and user of prostitutes - was the only one who could be persuaded to publicly support his Fuhrer. Nuff said! We have already reported that Marta Andreasen has left the UKIP delegation in Brussels. We can also now confirm that she is seeking to join Spain's EPP (European People's Party). However, the EPP's leadership is less than impressed with Marta and are rather reluctant to let her on board. But we should not forget that Bannerman was also intially rebuffed by The Tories in 2010. And look what happened to him! Marta shouldn't get too upset at this stage! How sad that Dartmouth is now declining to fund Lexdrum House in the South West. He actually now expects Trevor Colman to pay for the lot! We can also confirm that Malcolm Wood is placing heavy pressure on the Earl to back Farage following Bannerman and Andreasen's very public criticism of Nigel. Farage wants to close Lexdrum and it has been suggested to us that the Fuhrer is just pulling Dartmouth's strings in order to achieve this. as promised, an update [for your info] following the meeting held at lexdum on sat 21st, re item 12 on agenda, "loss of s/west support" and the outcome of a rather heated [at times] debate on the loss of financial support for the funding of the regional organiser due to trevor colman withdrawing his contibution of financial support for this purpose. The Death of UKIP by Richard North. Richard was UKIP's former Research Director in the European Parliament. However, it has also to be said that political parties are very poor vehicles for securing major political change. They tend to respond to events, rather than lead public opinion, their main concern to get elected and then stay in power. Yet it is precisely this model chosen by one branch of eursocepticism - the Farage paradigm. And even in this the party has not been successful. One might here observe that, prior to 1975, no europhile ever stood for election on a platform of joining the then Common Market. In the election prior to our entry, joining was not even on the Conservative Party manifesto. Thus, contradicting all logic and experience - and from a position of considerable weakness - the Faragistas believe they can reverse the process by using the electoral process. We hate to say this but Bannerman's breakdown of the failures of UKIP is spot on. He rightly blames Farage for dictatorial leadership, arrogance and bloody mindedness. He admits that UKIP failed dismally in the recent elections and slams the leadership for the failure to provide a clear strategy for the party. However, DB must also equally share the blame for this lack of vision. He was, after all, in charge of policy! To blame Farage for his own shortcomings is a bit rich! Bannerman also slams Farage and Pearson for failing understand UKIP's own manifesto and confirms that UKIP is in dire financial straights. He also condemns "Nigel's taste for pursuing personal vendettas on the party’s credit account" and blames the NEC for numerous mistakes such as backing the AV vote without understanding the implications of such a move. A truly damning document which needs to be read by every UKIPPER. We have highlighted some of the more interesting passages in red. However, we still condemn Bannerman for his duplicity and his willingness to use the membership of UKIP for personal gain. He was and will always remain a political prostitute who will do anything to further own career. Readers of this blog should remember that it was Farage who was instrumental in promoting him as the lead MEP candidate in the Eastern Region. He was warned at the time that Bannerman was using UKIP. He ignored all the warnings. And we have no sympathy for those UKIPPERS in the East who also ignored all the warning signs. They had every opportunity to back Robin Page, John West, Eric Edmond, Piers Merchant, David Abbott and Del Young when they called for a full investigation into allegations that the Eastern Region selection had been rigged in Bannerman's favour. Let us not forget that these six individuals were attacked and smeared by Farage's supporters while the bulk of the membership stood by and remained silent. Page, West, Edmond, Young, Merchant and Abbott have been vindicated. For people like Douglas Denny to now complain that Bannerman has betrayed the membership is sadly too little, too late! They had EVERY opportunity to stop the man before he was elected. That they failed to do so is a matter of public record. We would also be interested to know how Bannerman can justify joining a pro-EU party when he still claims to be committed to seeing Britain leaving the EU? And have you noticed how all the usual Farage sycophants such as Mike 'Wolfman' McGough and Ray 'Skeptyk' Finch have remained silent? Usually, they are the first to rush onto the net with claims that everything is just fine and Nigel is still great! Even they can't spin this one! It is with regret and sadness that I today resigned the UKIP whip as an MEP and as a member of UKIP. I will be returning to the Conservatives, accepting the Conservative Whip as an MEP for the Eastern Region in the ECR Group. I assure all of you who have backed me through the last 7 years in UKIP, as Party Chairman, Deputy Leader and Head of Policy, that I have in no way changed my views on leaving the European Union. I will personally remain just as committed and passionate to the noble aim of withdrawing from the political EU superstate as I have been with UKIP. Nor have I sought or expected any special treatment from the Conservative Party. The Prime Minister in his capacity as Party Leader and Co-Chairmen have only confirmed that I will merely be treated in exactly the same way as any other Conservative MEP. They also accept that I have not changed my views. May I say here sincerely that I do have great regard for Nigel Farage, and fully acknowledge his talents. I think he is one of the finest orators in British politics and has used that oratory with great passion and effect to promote the Eurosceptic cause at home and to enlighten and inspire similar causes within fellow nations in Europe. Nigel has shown genuine courage in the bearpit of the European Parliament, and has spoken brilliantly and forcefully on a whole number of vital issues. Nor do I doubt his dedication to the cause, and the remarkable energy he has put into it. In my resignation, I have not called for Nigel to resign as Leader, as others have, as I believe he has a clear mandate. However, this resignation may cause many in the party to reflect on the negative direction and confused objectives of the party under Nigel's style of leadership. For I regret that following the washout in the recent domestic elections across the UK, I have lost all faith in UKIP’s ability to win the argument on Europe, which I now believe can only be credibly achieved through a Conservative Party that has demonstrated to me that it is genuinely and deeply Eurosceptic at all levels - such as the work of Conservative MEPs to defend British interests under the new Leadership of Eurosceptic MEP Group Leader Martin Callanan - and which shares much of our mission. 1. The lack of a proper plan and objective: I joined UKIP because I believed it had real opportunity to establish itself as a serious, credible, alternate political party which could help achieve, through political pressure, influence or elected MPs working in coalition, its goal. I believed that the EU issue was not one single issue but had become so vital in the control over our lives that it dominated all others, and that normal domestic politics could not resume until our relationship with the EU was fundamentally addressed and changed. I was prepared to make real personal and political sacrifices to that end, because I am someone who always puts my country first. But for UKIP to achieve its aim as a political party merely obtaining more MEPs at European Elections would not be enough. UKIP would have to win directly elected MPs in Westminster. It could only have done this through creating and promoting a host of domestic policies, by winning local council seats and building up support in non-EU elections. This is because it is only Westminster MPs who will get the UK out of the EU, not British MEPs. Even if UKIP, for the sake of argument, could win all 73 British MEPs in the European Parliament, it would still not change the UK’s relationship with the EU. That must come through a substantial, credible political party which is strong in domestic elections. So, I regret to say that the token UKIP ‘Plan’ which was shown to MEPs and the party before disappearing from view is merely planning for failure. Comprehensive failure. Its stated core aim – to ‘win’ the European elections in 2014 by having 20 elected UKIP MEPs - shows a complete dearth of ambition. There is no mention of how UKIP intends to achieve elected Westminster MPs. It does not explain how the party will win more local council candidates. It is just about doing well in Euro elections - and that simply isn’t good enough. If the Green Party can get an MP elected, then UKIP could have done likewise. But where was the Green-style strategy of building a cluster of local council seats in target areas to establish the party’s credibility with local voters ( they obtained 13 seats over 10 years ) of putting forward one of their best candidates in their leader Caroline Lucas. and then targeting the seat with activists during the election period ? There was none of that in UKIP because there is no proper discussion of strategy in the party and no credible plan to win any seats. Even the few electoral successes pointed out in the May elections, such as the Ramsey Town Council, Newry, Tunbridge Wells and Buckingham successes, were achieved despite rather than because of the party. They were down to exceptional individual achievement and commitment, not due to a political party that knew the importance of winning local and domestic elections and was prepared to back them. There was no serious support, training or funding for local elections, as promised. As ever, candidates were left to hang out to dry, The party’s results show the lack of planning or proper strategy – including the loss of some very hard working Staffordshire councillors. The more scarce one’s resources, the more vital such a plan is. It is this hole in strategy and strategic thinking that has made me despair of UKIP ever achieving its aim. The party should know what it is attempting to achieve. It must put in place the right mechanisms such as the right focus, policies, funding and support - to achieve the goals it has set. No company chairman, no military general, no campaign group, and certainly no serious political party can get away with such a woeful and reckless lack of strategy. It lets everyone down, It betrays the hard working activists who pound the pavements and stuff envelopes. It is like a general sending troops over the top with no ammunition, no equipment, no training and no direction. Worse, if UKIP merely exists to damage the main Eurosceptic centre in the UK, the Conservative Party, and to prevent it succeeding in reaching Government, with such muddled and incoherent thinking, then it does not serve our shared cause but detracts and damages that wider cause. 2. The lack of belief in domestic policies. As well as a plan, a political party seeking to win domestic election needs attractive domestic policies. This is because the voters do not put the EU as a top issue. They put domestic issues such as jobs, the economy, health, education, crime, immigration and defence as their top issues. If UKIP can’t link the EU to those issues, it will never be relevant to domestic elections. If it is not relevant to domestic elections, then UKIP will never achieve its stated goal. This goes to the central dilemma of UKIP: is UKIP a proper political party or it is really a pressure group ? Too many UKIP members and some MEPs want just to talk exclusively about the EU. However, they could do that just as effectively in one of 60 plus Eurosceptic groups. A serious political party must act and behave differently. As Head of Policy, I spent 4 years of hard work creating 18 policy groups to produce a comprehensive set of domestic policies that UKIP could campaign on. I am told the General Election manifesto of 2010, which I wrote collating the contributions of many talented and professional people, was the best the party ever produced. Moreover, the mini manifesto proved to be the most popular campaigning document for our activists and members. Candidates around the UK reported that those policies chimed well with voters and helped to achieve an uplift of 50% in UKIP’s 2010 general election performance. Despite such proven progress, Nigel as Leader has chosen arbitrarily to jettison all these domestic policy papers. He ordered them off the national website and, as the Chief Executive reported to the NEC, the party acted to “wipe the slate clean’’ of all such policies. Nigel chose to do this just before the most important domestic elections that UKIP were to face between now and the next European and Westminster Elections. In my view, this has been an act of sheer political vandalism. As a result of this one action, I believe that UKIP might as well be a Eurosceptic pressure and campaign group, and forget about being a political party. Policies are not just for manifesto launches, they have to be campaigned on day in, day out. This extraordinary decision, which has come from Nigel personally, albeit influenced by others, could almost give some credibility to the craziest conspiracy theory bloggists – that Nigel is a plant who is really out to destroy UKIP’s chances from within. I do have good reason to suspect that UKIP has indeed been deeply infiltrated by those who wish harm to its cause. However, this decision really comes down to his lack of belief and appreciation of the role of policy, something I felt it my duty to communicate during the Leadership battle. Examples of this attitude include the time in Lord Pearson’s political committee, where Nigel angrily slapped down the draft manifesto and shouted around the meeting “what the hell is this ? !” He has never shown any enthusiasm for policies and has always exhibited contempt rather than gratitude towards the hard working policy committee members who worked so hard to produce those policies. I think this is fatal for a political party. Indeed, UKIP party leaders seem to be serial non-readers of manifestos. Lord Pearson was taken to task by the media in the 2010 Election for allegedly not reading the manifesto, whilst Nigel turned up at the Spring manifesto launch for the election that year claiming he hadn’t read it either. If UKIP Party Leaders are unable to read and articulate a mere 18 pages of summarized policy manifestos, and pathetically criticize them for being too long, then what hope have they got of ever coping with the demands of Government? I know - I worked for a Cabinet Minister who had to read hundreds of policy pages a day. No politician can reasonably know the minutiae of every policy, but they don’t have to. Nigel and other senior spokespeople are well enough skilled and capable enough to handle policy issues across the field and to promote the wider message. Yet he seems to fear the detail and would rather have only vague campaign messages. This is all just in case of being tripped up on some minor detail or being forced to read too much in the course of their duties. But UKIP’s relevance and credibility in elections has been blown as a result of abandoning the policy detail. 3. Attacks on MEPs. The Party has now taken against its own MEPs in the most unhealthy and hostile way. The Party’s own National Executive Committee (NEC) has seemingly used every opportunity to attack, belittle, and undermine its own MEPs. Whilst some MEPs to date have indeed not lived up to their agreed commitments, and this needs addressing, this is no reason for the NEC and others to declare war on the MEPs as a whole. Most UKIP MEPs I know have worked hard for the party in different ways, and not just as paymasters – that certainly includes Nigel. I myself have made great personal, political and financial sacrifices in order to serve the cause, and do not regret that for a moment. I accept the party is sailing close to the edge financially, and I have made additional financial contributions to help. But the point is that the overt linkage between financial contributions to a political party and selection to a public elected office, I regard as potentially very dangerous indeed. Yet my urgent calls for legal advice on whether this might be seen to be ‘Cash for Euroseats’ in the manner of ‘Cash for Peerages’ – i.e. the apparent connection between the party allowing candidates to obtain public office and the size of their donations to the party – seems to have gone unheard. The new NEC rules suggest that any future UKIP MEPs beyond 2014 will either be very rich or just be sycophantic placemen/women of the Leader. I even understand that the latest plan is to have at least 4 MEPs who do nothing as MEPs but are there only so they can pay all their salary to the party. Moreover, the proposed new constitutional changes are designed to put all the power in the hands of the Leader with the NEC acting as a rubber stamp on who is likely to become MEPs or stay as MEPs. This dictatorial change will take the selection of MEPs right away from party members and will divide the party still further. The valuable work of Eurosceptic MEPs in highlighting through the media and parliament how the EU damages British interests; in voting against even more damaging EU laws and intervention, and in taking the lead for the cause in their constituencies, seems now to count for nothing in UKIP. UKIP MEPs will only be there in future to keep the party solvent or to pay lip service to the Leader. They will not be there to represent a sizeable proportion of the British people. Under these criteria, I think UKIP does not deserve a single MEP in 2014, let alone to become the largest UK Party in the European Parliament. This is because Eurosceptic voters will be ill served by MEPs whose only function will be as party paymasters. In addition to NEC attacks, Nigel as Party Leader and Co-President of the EFD Group has seemed to take an ever more aggressive approach to his own MEPs. He has sought to drive many UKIP MEPs out of the Group and even out of the party. They may not have behaved as saints, and some may have put themselves beyond the pale, but I cannot understand the logic of this relentless denigration of UKIP MEPs, especially publicly on the media. Of the 13 UKIP MEPs elected in 2009, 3 have now left the EFD Group and one of those has had the UKIP whip removed. Of the other 10, Marta Andreasen has launched an extraordinary attack on Nigel's leadership ( please note that I had no knowledge of this attack and our actions are not connected ). In addition, Nigel has openly called for the deselection of Gerard Batten, the London MEP. He is now trying to blame the highly dedicated John Bufton for the recent Welsh Assembly failure. This is in spite of the fact that John’s win was the undoubted great success of UKIP’s 2009 Euro elections night. For my part, I have been banished from the party’s inner circle for having the temerity to stand in the Leadership election even though I made it clear that I valued Nigel and wanted to have Nigel as the face of the party and Leader in Europe. Other effective MEPs have incurred his wrath for not doing things the UKIP way and may be deselected too. As a consequence of this illogical stance regarding UKIP’s own MEPs, the EFD Group has been put in severe danger of collapse. Trying the fill the numbers gap by courting the allegedly less savoury end of European Parliament MEPs is surely not the answer. 4. The way the Party operates. Whilst no political party operates in a smooth, flawless and joined up way, I do think that UKIP lets its members and the cause down badly by the shambolic and secretive manner in which it conducts its business. This is not a criticism of individuals. The party has moved in the right direction with the hiring of a number of professional and skilled managers and advisors, who have much to offer and have already made a difference. But it is more about the culture of what I call ‘Aggressive Amateurism’. This culture regards professional management with a mixture of distrust and contempt. It aggressively resists and attacks those who wish to do things in a better and more organised way. For example, UKIP has put its very own existence in peril through an arrogant disregard for legal processes and proper administrative processes. The Supreme Court only narrowly spared UKIP financial ruin because it could not handle its own paperwork properly and because of unwise gung ho public celebrations after an earlier, favourable judgement. The party’s conduct, the failures in the processes of NEC decision making, and with Nigel's taste for pursuing personal vendettas on the party’s credit account, has led to a legal bill running at £140,000 a year. This is an incredible sum which is well out of proportion to a party with a comparatively small membership base. It is a figure which should make all UKIP members demand to know why the party is squandering such massive resources on so many ‘avoidable accidents’. When it came to the debate over whether or not to back Alternative Vote (AV), the process of decision making was a joke. One of the most important strategic decisions in UKIP’s history and there was no proper analysis. There was no consultation with experts in the field. There was no strategic sit down with all the advisers involved. Instead, there was just a half baked, rushed and loaded item on the NEC agenda. Indeed, UKIP’s own constitutional policy group, which had spent 3 years studying the options, was not even consulted. I understand that Nigel was the only person in the Political Strategy Committee to back AV. The decision to back AV only received the support of the NEC through an appeal to loyalty and not on the arguments. It was also against the overwhelming resistance of the membership. Had the AV Referendum succeeded, UKIP could well have been destroyed in its aim of winning domestic elections. There may have been more preference votes for the party but a deeper analysis shows it would have made it far less likely for UKIP to win a House of Commons seat - which is surely the party’s main goal. Whatever the rights and wrongs of the decision, it is the lack of a professional decision making process which is the problem I am highlighting. Nor was the NEC willing to fund the minimum amount of research needed to make an effective case for an alternative, Alternate Vote Plus (AV+) Campaign. They seemed to have no collective understanding of how important the right voting systems are to a small political party and what a difference a better, more balanced system could make. AV+, in contrast, would give every voter 2 votes and could have transformed UKIP’s potential by making it possible for the party to win some 20 MPs and work in a future coalition government. All this potential has now been lost. In conclusion, I have sadly given up on UKIP ever becoming the serious, credible, fully-fledged political party that it could have become, and which I have devoted many years to helping achieve. The party did have genuine potential as the new protest party and fourth largest party, if it had embraced and sold its policies and messages with real effect. But following the disappointing performance in the recent domestic elections, I have concluded that the wider cause is best realized in the longer term through a serious, credible, fully-fledged political party in the form of the Conservative Party, which I see as working hard for Britain, and which has the domestic presence able to deliver radical change, and not within the UKIP pressure group. I will continue to make the case for EU withdrawal to the best of my ability, but will be doing so in a different place. I have made very many fine friends in UKIP. I genuinely hope we can all remain on good and friendly terms while serving our shared cause. It just gets worse for our Nigel! Marta Andreasen has left the UKIP delegation in the EFD group. However, she is still a member of the EFD group. She is now a 'single person delegation'. This is yet another hammer blow for Farage who was so desperate to keep this quiet. And who can blame him! The departure of Bannerman for the Tories on Tuesday and now Andreasen leaves the UKIP delegation. How he must curse the day that he brought them both on board! But we did warn him! Andreasen now has complete control of her staff and her budget. Senior figures in the party are now openly stating that Farage should resign at the earliest opportunity. Marta is hoping to join another party. Can you guess which one? And can we say just how much we enjoyed her new Brussels look. Those clothes were just delightful! Bannerman: Political Prostitute, liar and traitor to the euro-realist cause! I am appalled and disgusted with you: - a person who I thought had integrity but has now proven without a shadow of doubt how shallow in principles you really are. What is worse for me personally to learn of this event, is I considered you a friend too, someone invited to stay under my roof, eaten at my table, and considered a trusted companion on the road towards a great cause for Britain against the EU; a person who had previously denounced all the other cynical political parties - especially the Conservatives - who have been for over thirty years and still are - busy selling the country down the river..... and now you have joined them !! For what? ... your own selfish, power-greed, tongue-slavering, money-grabbing reasons? What a traitor ! What a Judas! How can you can face yourself in the mirror every day? To salvage any kind of credibility as a decent human being you should now resign your MEP position - so hard worked for and gained on the back of UKIP's many workers who deserve better than you by far ! Resign, and I shall accept you still as an honourable person but understand that you cannot continue with UKIP (for whatever reasons) - then, and only then, at least you will have done the decent thing. Stay as an MEP, having got there under the UKIP banner only to have defected and distanced yourself from your own previously announced principles - espoused so volubly for years under UKIP's name - and you will prove to all you are as base as the lowest on the planet. Readers may recall that Mr Denny was one of Bannerman's staunchest supporters and frequently attacked this blog when we pointed out that Bannerman was a political prostitute without a single redeeming feature. We now trust that Mr Denny will be less critical when we point out unpalatable facts to him! Mr Denny must also regret refusing to back calls from Robin Page, John West, Del Young, Eric Edmond and David Abbott for a full investigation into the rigged Eastern Region MEP process. This was also despite Piers Merchant's call for one. A full investigation would have revealed much and probably resulted in Bannerman being disqualified from standing!! It's overwhelmingly clear now that trusting Cameron with Europe will be as misguided as trusting Blair on Iraq". "I have been increasingly impressed by the leadership shown by David Cameron in dealing with this country's problems. In particular, the Government's determination to clean up the economic mess left by Labour. "Similarly in Europe, I have been pleased with the robust stance taken by David Cameron and Conservative MEPs over the EU budget negotiations and I believe that it is Conservative MEPs who are working hard to defend Britain's interests. In contrast, as a member of UKIP I witnessed too many colleagues obsess with single issue politics, internal fighting, and shouting from the sidelines. This behaviour does nothing to serve the best interests of the British people." We note that the official UKIP website still fails to mention Bannerman's defection. The Tories will regret the day that they allowed Bannerman back into the fold. It was actually Hague who was VERY keen to get DB on board. 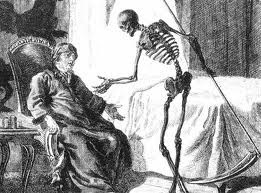 Indeed, he was so keen that he didn't even ask David if there were any skeletons in the cupboard. Silly boy! The OLAF investigation into the allegations that Bannerman (along with Agnew) was illegally paying Peter Reeve is still ongoing (LINK) and there are certain other issues that could very well embrass the Tory Party. An employment tribunal is another. And we do hope that DB enjoyed his recent trip abroad! We can confirm Geoffrey Van Orden decision (Tory MEP Eastern Region) to stand down in 2014 proved music to DB's ears! DB hopes to be lead Tory candidate on 2014. We can confirm that many Tories in the East were not very happy when they heard the news. Many regard Bannerman as a political prostitute who would sell his own mother if it suited his purpose. And many are also unimpressed with Bannerman's offer to 'dish the dirt on UKIP'. One Tory said to a member of the Junius Team that "I wouldn't trust him as far as I could throw him". Another said that "David Campbell Bannerman was happy to betray the party that got him elected. So what would stop him doing the same to us in the future?" Quite. DCB's statement skates rather too smoothly over the fact that until yesty he belonged to a party that intends to get Britain out of the undemocratic EU mess and today he has joined a party that has no such intention. Careerism, I would say. If he had won the UKIP leadership he would still be in it. So let's get this right: someone who thinks the UK should leave the EU is now rushing to join a party whose leader has (a) made it clear that he will never allow voters a choice on whether to leave the EU; and (b) who has bent over backwards to give in to EU demands over the last year including an open-ended commitment to the bailout fiasco. What has Campbell-Bannerman been offered? He says: "Once again, the Conservative Party is proving, as it has so many times before, that it is the only party that can be trusted to sort out Britain's economy and stand up for Britain in Europe." He clearly has a strange definition of "trusted". Sadly, many UKIPPERS failed to heed our warnings about DB. Indeed, we were often criticised - along with GLW - for attacking 'a good man'. We have consistantly stated that he was a political opportunist who would do anything to stay on the EU Gravy Train. His 'euro-sceptism' was just a cynical ploy and we have been proved right. I was officially appointed as Returning Officer for the UKIP internal elections which were to decide on the regional list candidates for the 2009 European Elections. My duties were not clearly defined but included supervision of the election campaign and of the subsequent count. I was appointed after the shortlisting process and therefore took no part in that. However, it was not entirely clear to what extent my remit extended to scrutinising the validity of the shortlisted candidates. Returning Officers normally have some responsibility for ensuring candidates are correctly nominated. During the course of the election campaign I received complaints on almost a daily basis. Many of these were about the validity of the candidates and often about the process of shortlisting . I formed a view that something had gone wrong in various regions and in some it was sufficient to tarnish the election process itself. I was placed in a practical position where I had to rule at various times in the campaign whether or not a candidate was a valid candidate because of a chorus of complaints and questions. I was very keen to try not to disrupt the complex voting process once it had started and so where there were complaints that looked credible I said I would make a final ruling after the count. I could then take an overall view and also give parties a chance to re-consider their position in the light of the results. In my official report to the National Executive Council ( which I can make available), I stated that I considered the overall position in both the Eastern and London untenable. As far as the Eastern region was concerned I formally recommended that a special sub-committee be set up with a remit to investigate all the complaints and determine how to resolve them. To my surprise the NEC rejected this recommendation after a very brief discussion which I believe was quite inadequate and, furthermore, decided to take no action at all. Given the complete failure to even investigate the serious and continuing complaints and given all my original concerns, it is my considered view as Returning Officer that the results of the internal election in the Eastern Region are unsafe and invalid and that the entire process should be re-run. Several UKIPPERS in the East did express some unease about the rigged selection process but soon backed down. More fool them! To think that the East could have had someone like Robin Page representing them. Instead, they got DB and Agnew! The news that Bannerman has finally returned to the Tories continues to generate publicity. 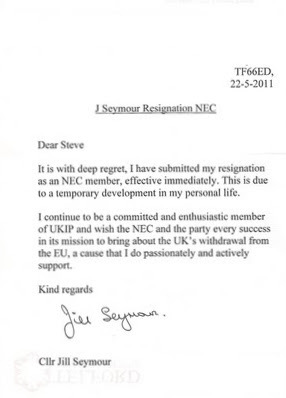 Jill has resigned from UKIP's NEC. In a letter dated 22nd May, she 'claimed' personal reasons were behind this decision. Poor Jill! Junius says: We hope the wife is ok! Gerard seems more concerned about his own injuries! It never ceases to amaze us how quickly the sycophants turn on their idols when it is revealed that they have feet of clay. Take this from Lisa Duffy! Please find attached a Statement from the Party reference the resignation of David Campbell Bannerman who has now joined the Conservatives. 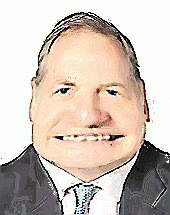 It is clear that David Bannerman has decided to put career before principle. He was obviously disappointed with his result in the Leadership election last year where he achieved 14% of the vote, and concerned about whether he could get re-selected by UKIP members in the Eastern Region. So he has decided to secure his berth in the European Parliament until 2019, by joining a pro-EU party. David has expressed his admiration for David Cameron, who has announced that he will not give the people of this country a referendum on Europe, because he believes we should stay in. He has some nerve criticising UKIP’s credibility. 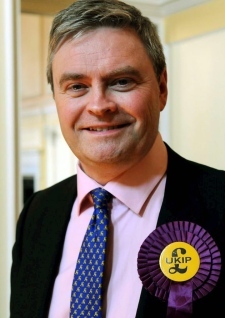 When he was chosen as a candidate for UKIP in 2008, David signed a statement that said that he would “remain as a member of UKIP for the full 5-year term or otherwise retire from the Parliament”. We call on him to resign, so that we can get a real Euro-sceptic to take his place. Is Ms Duffy hoping that UKIPPERS will forget her previous deep seated admiration for the serial liar? After all, both she and Reeve actively campaigned for Bannerman to become UKIP leader. And let us not forget that Reeve sat on the panel that 'selected' Bannerman. Our readers may recall that Bannerman had made it known that he would continue to employ Reeve as RO if selected lead MEP candidate. That was a VERY big incentive for Reeve to let him through! What a shame that Reeve's salary as UKIP RO was paid in part by Bannerman! Can Agnew now be persuaded to pay ALL his salary and thus enable Reeve to continue living in the style he and Duffy have become accustomed to? We suggest that Duffy turns her fire on Farage. Don't forget that it was the Fuhrer who was instrumental in promoting Bannerman in a rigged MEP selection process! A Tory MP of our acquaintance told us that earlier this year Bannerman contacted senior Tory officials in Brussels and the Eastern Region with an offer to rejoin them IF he was allowed to be their lead MEP candidate in 2014. So when was Bannerman going to tell the membership of UKIP about his plan to jump ship and return to the Tory fold? "Similarly in Europe, I have been pleased with the robust stance taken by David Cameron and Conservative MEPs over the EU budget negotiations and I believe that it is Conservative MEPs who are working hard to defend Britain's interests. In contrast, as a member of UKIP I witnessed too many colleagues obsess with single issue politics, internal fighting, and shouting from the sidelines. This behaviour does nothing to serve the best interests of the British people. "With the recent failings in domestic elections, the ditching of policies and the lack of any credible plan, UKIP has confirmed it is not a serious, credible, fully fledged political party but merely a pressure group. I have been a proud member of the Conservative Party in the past and I am proud to come home to the Conservatives today. Once again, the Conservative Party is proving, as it has so many times before, that it is the only party that can be trusted to sort out Britain's economy and stand up for Britain in Europe. "I stood for the European Parliament because I wanted to work for the best interests of the United Kingdom and my constituents in the Eastern region. I now feel that I can best serve them and their interests as a Conservative member of the European Parliament. Of course, I have not always seen eye to eye with the Conservative Party on every issue. I continue to believe personally that Britain should leave the EU but I also believe that while we are members we should fight our corner to secure the best deal possible." And Farage was the last to know! More on this later. Roger Knapman remains one of UKIP's most important and most popular figures. He is credited with leading the party to a sensational victory in 2004, when UKIP changed the British political scene forever, and sent chills down the spines of the political elite. It was Knapman's contacts and political savvy that brought movers and shakers into the party, and developed the substantial talent within the party's many branches. Knapman is a wealthy man, with a highly successful political career behind him, a close-knit and successful family, and many, many friends from all walks of life. And boy, is Nigel Farage jealous! Farage is seething with indignation over Marta Andreassen's attacks on his leadership abilities, his financial affairs, and his inability to get on with people. In a dignified and restrained manner, Knapman issued a statement of support, in which he expressed his hopes for a better future for the party. In the typical nasty and vindictive style, one of Farage's acolytes - possibly the republican sympathiser Herman Kelly - issued a statement attacking Knapman. This was printed on the website of Parliament magazine, but following a complaint it was subsequently edited, removing some of the more vicious words. It is typical to note that Farage himself was not quoted. He was nicknamed by some of his staff in Brussels as "Macavity" - when anything bad happens, Macvity is never there. He not only lacks Knapman's wealth, charm, and delightful family life, but Farage, who never completed his education, is also utterly devoid of the political savvy that enabled his predecessor to build UKIP into a successful political force. No "Mr 2%" is Roger Knapman, who will go down in history as one of the Maastricht rebels, sacrificing his future in the Conservative party on a point of principle. It is widely held that it was Farage who gave the story - complete with spin - about Knapman's employment of Polish labourers on the renovation of his substantial home. This is, of course, the man who claimed to have been on a flight with Chris Huhne just in order to get his little face in front of a camera. When questioned by police, it was revealed that this was untrue. Not only did he set out to deceive, but he has wasted the time of an already overstretched police force. Nigel Farage is not fit to clean Roger Knapman's shoes.